Each frame is .1 second apart. In this race, Pieter van den Hoogenbond equaled the world record he had established in the semi-final with a time of 1:45.35. In claiming the gold medal, he beat Ian Thorpe of Australia. In this third lap of the race, when fatigue was mounting, Pieter van den Hoogenbond's stroke frequency was 43.2 strokes per minute, a stroke being from a hand entry until its next entry, and the time for this 50m was 27.36 seconds. The general features displayed by the swimmer at the 35m mark of the race, continue to be evidenced here. Normally, it would be expected that some variants between fatigued and no-fatigued states would occur but none seem to be evident. The swimmer is exceptional in that he is "holding his stroke" well. A detailed frame-by-frame analysis would duplicate much of that discussed in the previous analysis of Pieter van den Hoogenbond's stroke at the 35m in the same race. Consequently, only the general features of the stroke will be repeated in this analysis. The directness of the pulling actions with the full hand/forearm surface of both arms is amongst the best displayed on this web site. Not only are they more direct, and therefore, exhibit close to the least vertical movement component during propulsion, the length of the effective pull is also close to the most extensive witnessed. The left arm pull approaches perfection. Despite the right arm starting less efficiently, the latter part, the extension phase, of both pulls remains deep and direct. Neither arm extends fully at the end of the pull, however the round-out that is displayed is minimal but still beneficial and technically correct. The shallowness of the kicks is another outstanding feature. Anytime a crawl stroke kick drops below horizontal, it creates drag resistance. Pieter van den Hoogenbond spends little time with either leg below streamline. This leads to an hypothesis that bigger kicks exhibited by most other swimmers are excessive. That excess is usually required to counterbalance excessive vertical movements in the early phases of the arm actions. By limiting vertical movements after entry, this swimmer does not require large or deep kicks. The amount of time that Pieter van den Hoogenbond is in good streamline is possibly the most exhibited on this web site. Given his accomplishments at the 2000 Olympic Games, this feature must be a significant contributor to his successes. It should serve as an excellent model. 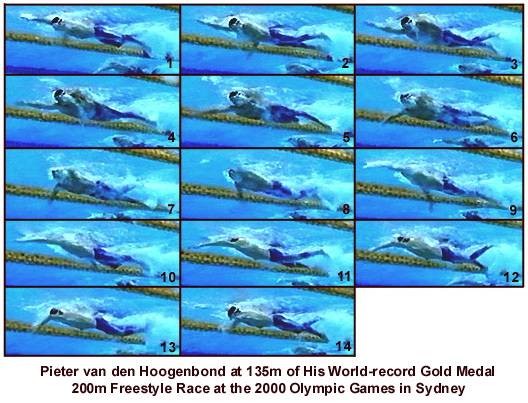 Pieter van den Hoogenbond equaled his own world record in this race while defeating Ian Thorpe. Previously, this analyst had proposed that Ian Thorpe's stroke pattern was a very worthy model. However, because of Thorpe's regression in technique from the 1999 Pan Pacific Championships to the Australian Olympic Trials, it now is apparent that Pieter van den Hoogenbond is a better model for crawl stroke emulation.